The future is now. The fourth industrial revolution is in full swing. Worldwide! Networked production and control processes in complex machine environments are no longer a thing of the future. The foundation for dynamic, real-time-optimized, and self-organizing industry processes is information gathering and the further processing of that information. As providers of data, sensors are essential for Smart Factories. 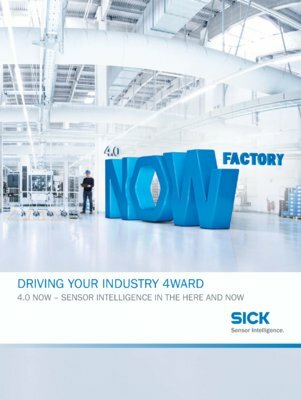 SICK, an expert in sensors, is therefore at the forefront of developments. Sensor technology is the prerequisite for successful implementation of Industry 4.0. As building blocks of the future, SICK sensors act in an intelligent manner and can further process the collected measurement data and autonomously transmit it. And SICK is continuing to make advances in the areas of networking and data transmission. We enable our customers to collect targeted, application-specific data by individually configuring our sensors for optimized and efficient production processes. Let’s continue to build on this together! The data-based, networked, and autonomous value creation chain in production and logistics is the culmination of recent technological innovation. The nature of communication is changing. In transparent production processes, machines communicate both with one another as well as directly over the Ethernet or in the cloud via intelligent sensors. This allows the Smart Factory to become a reality. A Smart Factory is a prerequisite for Industry 4.0. Every sensor, every machine, and every human involved can communicate with and among one another at any time. This enables the development of completely new applications. Production data is a valuable asset for every company. Providing protection against data manipulation and defining how further processing is controlled are strategies which are part of the system solutions from SICK at the beginning of the networked value creation chain.